How It’s New York: The subject of the play Imagining Heschel is Abraham Joshua Heschel, a Jewish theologian who taught in NY, at the Jewish Theological Seminary (JTS). Much of the play takes place in NY. How It’s Irish: Originally a two-hander, the play now includes an Irish character, Father Brian Martin, who objects to the loss of Latin and other reforms pending in the Second Vatican Council. The Second Vatican Council declared that “the Jews should not be presented as rejected or accursed by G-d” and that the passion cannot be charged against all the Jews then or later. A version of this review first appeared in The Arty Semite, the culture blog of the Jewish Daily Forward. A dull play about a fascinating subject, and a controversial time. Abraham Joshua Heschel (1907-1972) was a fascinating individual. Too bad Colin Greer’s play, Imagining Heschel, is such a yawn. Heschel was born in Poland, and got out before the Holocaust; he was a poet, teacher and author of influential works including the 1955 classic, “God in Search of Man.” He believed that Jews should fight for justice, and he marched with Martin Luther King, Jr.
You learn some of this in Colin Greer’s play, which focuses on Heschel’s decision to participate in the Second Vatican Council. I can’t recommend Imagining Heschel, yet I’m glad to have seen it. Those with a strong interest in the man may want to make the excursion to the Stella Adler Studio of Acting on West 27th Street as well. This is the second outing for Greer’s play. 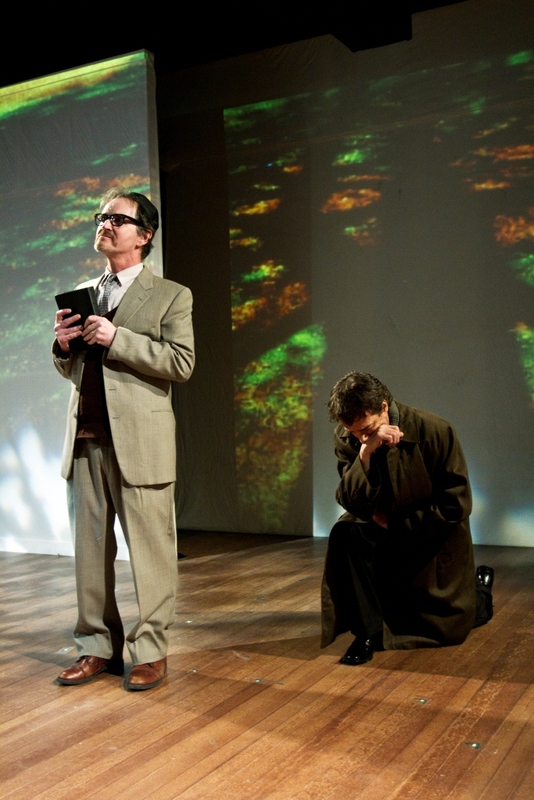 An earlier incarnation starring Richard Dreyfus and Rinde Eckert at the Culture Project in 2010 never officially opened, although it played its entire scheduled run — critics who had attended could not publish their reviews; others were uninvited. 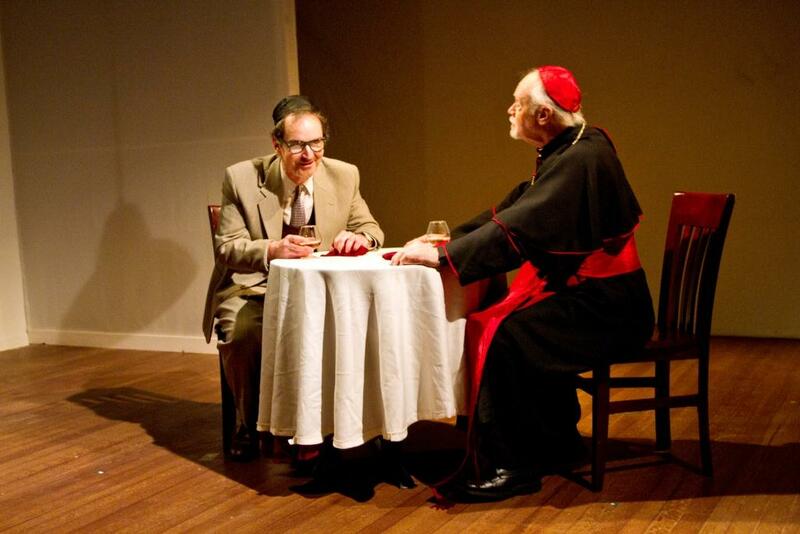 At that time, the play was a two-hander between Heschel (Mickey Ryan) and Cardinal Augustin Bea (Chet Carlin), who coaxed Heschel to come to Rome and be the voice of American Jews on the Council. Now there is a third character, the Irish Father Brian Martin. Father Brian (Guy Mandic) objects to the reformation of the Mass and to the State of Israel, and his few scenes, weirdly, are the liveliest. They don’t go anywhere, but at least there’s something going on in them, and some real conflict. Most of the play involves Bea, played by a lovable Chet Carlin, coaxing Heschel, played by Mickey Ryan with subdued intensity, to come to Rome. Heschel complains about the Vatican’s indifference during the Holocaust, and insists the church stop trying to convert Jews. Bea says accommodating things, but Heschel takes offense at something. Then they smooth things over. Rinse and repeat. We watch the characters bond or spar at Heschel’s favorite tree in Riverside, at his home over tea, at a Jewish restaurant in Rome. We learn that Bea had Jewish friends, that he admired the way Jews were openly emotional. A scene of Heschel lecturing establishes his sense of universalism, as does his eulogy for Martin Luther King, Jr., which happens out of sequence — the play flashes around in time without letting the audience know. The acting from the three cast members is excellent, as one might expect from the Harold Clurman Laboratory Theater Company and the Stella Adler Studio. But what drew the most emotion from me were two sequences of slides. The first was images of the Holocaust set to a Yiddish song, while the second was a series of black and white stills of Vietnam, Martin Luther King, Jr., Kent State and other ‘60s shots set to the Chambers Brothers’ “Time Has Come Today.” It worked, but it was cheap, unearned emotion. Director Tom Oppenheim does what he can, but while the characters are interesting, the play isn’t. Greer conveys his interest in Heschel (although his final line about Jews needing the antagonism of Christians seems wildly out of character, as does his choice to say Kaddish without a minyan — they seem to contradict everything else we have just learned about Heschel), but never succeeds in dramatizing him. I loved the Mandic character, Father Brian….